Employees can suffer from a number of safety and health issues in an office. An employee’s safety is the responsibility of the employer and the office administration and should be given utmost priority. Following are the beneficial tips that should be applied in every office to optimize office safety. In order to avoid falls in the office, the files, boxes, and other materials must never be kept piled up in walkways. Cluttering the walkways can lead to disabling falls and even broken bones. The office material which isn’t in use anymore should be taken out of the office to an external storage area to facilitate de-cluttering. It’s commonly observed that employees collide with each other while turning in the hallways or around the cubicle walls and blind corners of the office. These collisions can lead to serious head and limb injuries. In order to avoid such collisions, convex mirrors should be installed at different intersections so that employees can easily see each other turning around the corner. All electrical wiring should be properly covered to avoid current transmission in case of short-circuits or any other electrical problems. 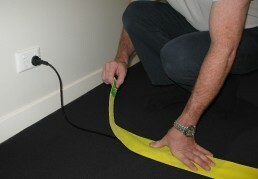 Also, the electric cords should never be stretched across walkways or placed under carpets and rugs as they pose serious threat to employee’s safety. Tile and marble floors in offices can lead to trips and falls as they happen to be extremely slippery. Therefore, proper carpeting is highly recommended as it provides a firm grip while walking or even running. Employees who work in dimly-lit offices suffer from long-term vision problems. Dim lights put strain on the worker’s eyes especially if they’re working on computers excessively. Hence, offices should be brightly lit to protect the employees’ eyesight. Employees often use tables or chairs with wheels for reaching files or any other office material that is kept at an elevated height. This practice can lead to life-threatening falls and injuries. Employees must always use an appropriate stepladder which is completely opened and placed on a leveled and firm ground. Properly functioning fire-extinguishers must be present in the office at all times. Also, there should be special exits to use, in case of an unexpected fire. Workers should also be trained how to exit the building without creating chaos and confusion if a fire breaks out in the office. Every area of the office should be a no-smoking zone. This is highly important to protect the health of the non-smoking workers. Isolated areas like bathrooms and kitchens should also be thoroughly checked on a regular basis to ensure that employee are not smoking in these public areas. There should be a proper ventilation system in every office to avoid breathing problems and suffocation. This is especially important in production houses where employees are working with heavy machinery. The tables and chairs used for the work should be of appropriate height so that employees can easily place their feet on the floor and sit with proper posture. If an employee is short-heighted, their workstation must be adjusted accordingly.